The Friesian’s average height is about 15.3, 16.3 hands. The Friesian is most often recognized by its black coat color, though color alone is not their only distinguishing characteristic. The bredd has powerful overall conformation and good bone structure, with what is sometimes called a ”Baroque” body type. Friesians have long, arched necks and well-chiseled, short-eared, ”Spanish type” heads. Their sloping shoulders are quite powerful. They have compact, muscular bodies with strong sloping hindquaters and a low-set tail. Their limbs are comparatively short and strong. Friesian horses also have a long, thick mane and tail, often wavy, and ”feathers” long, silky hair on the lower legs, deliberaty left untrimmed. The official bredd rarely has white markings of any kind; most registries allow only a small star on the forehead for purebred registration. The breed is known for a brisk, high-stepping trot. 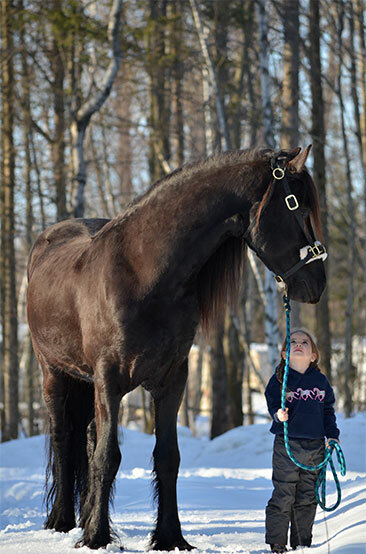 The Friesian is considered a willing, active, and energitics horse that is also gentle and docile. A Friesian tends to have great presence and to carry itself with elegance.